As answers to trivia questions go, George Patterson is the solution to a pretty neat one: Who scored the first goal for the Toronto Maple Leafs? 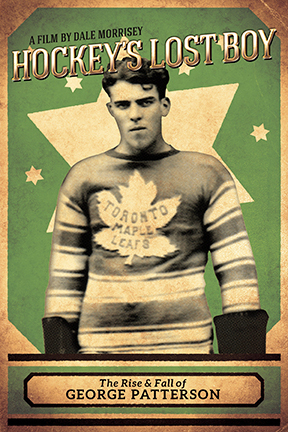 Filmmaker Dale Morrisey believes there’s much more to the Kingston man, who not only scored the Leafs’ first goal, he did so in his first game with the team, Feb. 17, 1927. “That’s a little asterisk thing,” he says of that particular fact, but in the process of making his latest documentary film, Morrisey came to discover a thread that connected Patterson to a long line of tragic characters throughout the team’s history. “There are similarities between George’s story and the way the Leafs operate,” is how Morrisey describes it. That’s the theme that permeates Morrisey’s documentary, Hockey's Lost Boy: The Rise And Fall of George Patterson, a film that will debut at the Kingston Canadian Film Festival Sunday, at 10:45 a.m. at the Grand Theatre. They met and McCullough brought all sorts of documentation, clippings and photos. “Basically,” Morrisey said, “he said, ‘If you want to make this film, here’s all this stuff—go to it.’” Seldom does a filmmaker get such a head start on a project—“normally that would be a year’s work right there, just pulling together that material”—and it wasn’t long before Morrisey was hooked on the idea. He quickly found Patterson’s story to be compelling. “Here’s this fellow, he’s playing semipro hockey in Hamilton, the Leafs buy his contract, bring him in, he scores the first goal after they go from being the St. Pat’s one day and the Maple Leafs the next,” Morrisey said. “He scores a really pretty goal to tie the game, the media goes nuts for him, in typical Leafs fashion, but after he has an OK year, he struggles at the start of the next season. Conn Smythe gives up on him and basically says we’re done with you. Patterson spent four years in New York, but in 1933 he was sent to Boston and his career, Morrisey said, started a slow slide. By the time the following season was finished, Patterson had also played in Detroit and St. Louis, where the former Ottawa Senators existed for a year as the Eagles before folding. After a 299-game NHL career that spanned nine seasons—in which he scored 51 goals and 78 points—Patterson played 11 more years of professional hockey, in Buffalo, Minneapolis, Cleveland, New Haven, Ct., and Hershey, Pa., before retiring in 1945. Along the way he was an all-star, a most valuable player and a team captain. Patterson comes back to Kingston, where he coaches at Queen’s University and later becomes coach of a senior team known as the Kingston Nylons. He’s courted as a future NHL referee and touted as professional coaching material. After running a filling station in Joyceville during the summers of his playing days, on retiring he starts a cement block business and capitalizes on the building boom of the fifties. Though his business life is on the cusp of prosperity, it’s at this point that Patterson’s hockey life descends into tragedy. The Nylons were a pretty fair senior team but they had trouble dealing with the team from Peterborough, and that’s who they were scheduled to face in the first round of the Ontario Hockey Association playoffs. At the time, there were two tiers of senior hockey, and teams that were unsuccessful in the upper tier dropped down a level and continued to play there. Part of the culture of the day was players got a cut of the gate receipts, so the farther a team went in the playoffs, they more money they stood to make. Even if they were no longer in the running for the big prize, the Allan Cup, the remained a pragmatic reason to keep playing. To celebrate the end of the regular season, there was a party at Patterson’s house. Here’s where the story diverges. Patterson maintained that he was not in the room when a plan was hatched to throw the series against Peterborough so the team could continue in senior B playoffs, where they could expect to go far. Word of the deed started getting around later that summer, and eventually the OHA convened a hearing in Kingston, “and it really hit the fan,” Morrisey said. Patterson was held responsible, and he was suspended from organized hockey for life. “He’s forced to live in the shadows,” Morrisey said. From then on, the Leafs really wanted nothing to do with Patterson. He died in 1977, just before the Leafs began their 50th anniversary season. “There was a really glowing obit written in the Globe and Mail,” Morrisey said, but the publicity director of the Leafs wrote a scathing reply, insisting the paper had it wrong, and Patterson hadn’t scored the team’s first goal at all. “It took a number of other people to write back to put Stan Obodiac in his place,” Morrisey said. In the documentary, Morrisey interviews ex-Leafs such as Doug Gilmour, Rick Vaive, Jim Dorey and Ron Ellis, who shares a special link to Patterson in that Ellis is the only Leaf since Ace Bailey to wear No. 6, and Patterson was the player who wore it before Bailey. The director weaves the thoughts of the latter-day Leafs with the path of Patterson’s career, to illustrate the parallels between it and corresponding points in the hockey club’s history. Morrisey’s research took him to Hershey and to New York City, where he came upon a historian for the Americans, who played their last season in Brooklyn. As it happened, that man, Stephen M. Cohen, was involved in creating an exhibit on that team to mark the arrival of the NHL's Islanders in their new home in Brooklyn in the fall. It was there that Morrisey learned what it was like to play for Big Bill Dwyer, the Prohibition era gangster and bootlegger who owned the Americans. The story goes that Dwyer told his ‘boys’ to load all the players into five limousines, and they drove, along with a sixth limo filled with booze, to the ranch, where they all got plastered. This would have been great, except one of the players, Prairie boy Red Dutton—from Russell, Man.—started bragging about how he could ride horses, and challenged his teammates to give it a try. Patterson was done for the season and so were the Americans. They won one game the rest of the way and were caught and passed for the final playoff spot by the hated Maroons. From his research, Morrisey believes Patterson got a bad rap from the OHA. Not only does Morrisey believe the Kingston Sports Hall of Fame should look past that episode and induct him in the local shrine, he says the Leafs should place a plaque in the Air Canada Centre to recognize Patterson’s first goal. “And I think he should be in the AHL Hall of Fame, too,” for a career where he scored 187 goals and more than 400 points. • Hockey's Lost Boy: The Rise And Fall of George Patterson, will premier at the Kingston Canadian Film Festival Sunday, 10:45 a.m., at the Grand Theatre. It will be released on DVD in the fall.